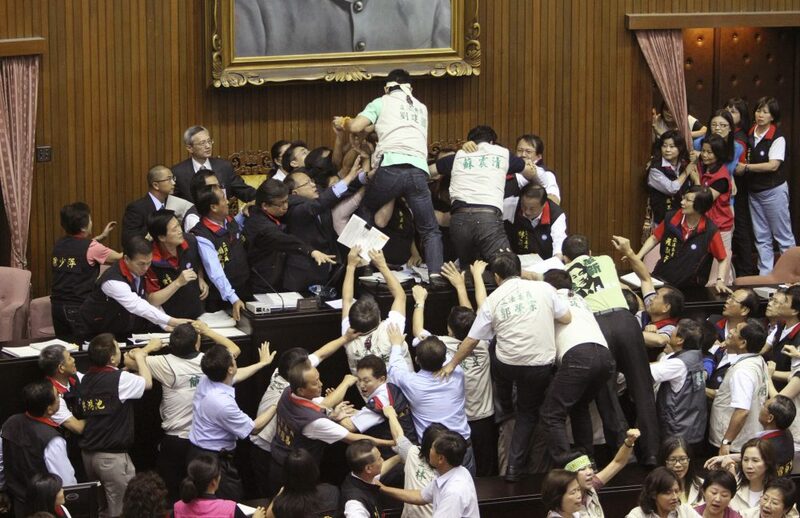 Ruling and opposition lawmakers brawl as discussions start on the Economic Cooperation Framework Agreement (ECFA) planned with China on the legislature floor, July 8, 2010, in Taipei, Taiwan. Lawmakers were seen shoving and punching each other in Taiwan's legislature after the speaker rejected an opposition bid to conduct a detailed debate on a contentious trade pact with China. Photo by Wally Santana/Associated Press. A body of research including our own papers shows overwhelming evidence that, over the last 20 years or so, trade integration with low-wage manufacturing countries like China has had dramatic effects on the manufacturing landscape in rich countries like the United States and Germany. It also appears this growing trade exposure is to blame, at least in part, for growing political polarization and increasing support for parties that advocate for populist and protectionist agendas. In our own work, we documented that in Germany during the last three decades, growing import competition from Eastern Europe and China has increased voting for extreme far-right parties, while export access to the same countries appears to have reduced it. But that leaves a question. For all the research showing that trade shocks that have impacted regional manufacturing employment also had regional effects on political behavior, it is not yet clear what mechanism causes this link. 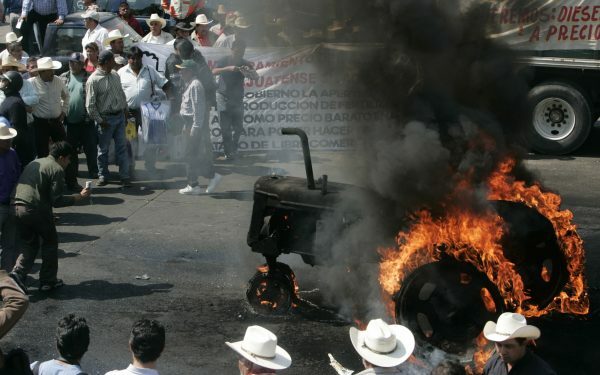 Mexican farmers protesting the removal of import tariffs on U.S. and Canada agricultural goods—as agreed to under the North American Free Trade Agreement (NAFTA)—gather around a tractor set on fire by demonstrators during a protest in Mexico City, Jan. 31, 2008. Photo by Eduardo Verdugo/Associated Press. One fundamental problem: We have far more potential outcomes that we would like to explain than we have natural experiments or variables that cause the outcomes. As a result, research often generates a large number of stand-alone causal effects on many outcomes with relatively little to say about possible causal links between these. To illustrate, the same types of regional trade shocks have been used to estimate the effect of import competition on manufacturing employment, social transfers, wages, legislators, voting, crime, marriage markets, and patenting. But we have not gotten a clear view of possible causal mechanisms, e.g. whether trade’s effect on one outcome might be explained by its effect on another. In some contexts, our lack of a fuller explanation is not a huge problem. For example, import competition may increase crime and reduce patenting, but the additional crimes are probably not being committed by laid-off inventors, and crime is not preventing researchers from inventing. In other words, there is probably no causal mechanism linking these two outcomes. But in other contexts, as with studying trade’s effect on labor markets and on voting, the lack of causal links between these two outcomes is a problem. If import competition has negative labor market consequences and makes voters turn to extreme or populist parties, then it is likely that there is a causal mechanism linking these two outcomes and it is important for policy-makers to know to what extent the populist backlash against globalization is explained by trade’s effect on labor markets. The search for causal mechanisms is called causal mediation analysis. Existing methods falling under this umbrella allow for the identification of causal effects only under restrictive assumptions. The most important restriction is that the explanatory variable is assumed to vary exogenously—in plain English, this means that you are effectively assuming the conditions of a randomized control trial. A second important restriction is that existing frameworks do not allow the explanatory variable to have any unobserved effects that also affect the observed mechanism. What does that mean? As an example, suppose we had a dataset of college seniors and in it we could observe, first, whether students attended a job interview training workshop; second, students’ dress code at a subsequent job fair; and, third, whether they secured a job offer. Suppose we wanted to ask to what extent the workshop helped with getting a job because it advised students to dress more professionally. To answer this question, existing causal mediation frameworks would have to assume that workshop attendance was totally random and additionally assume away any unobserved effect of the workshop—such as a more serious attitude by student job-seekers—that might influence students’ dress code and also directly affect their chances of securing a job through better interview skills. Under those assumptions we could estimate what percentage of the training’s effect on securing a job was explained by dressing more professionally—but this estimate may be totally wrong because the statistical assumptions are. For all the research showing that trade shocks that have impacted regional manufacturing employment also had regional effects on political behavior, it is not yet clear what mechanism causes this link. For example, students most likely attend job interview training workshops deliberately and not randomly. The most common solution to this problem is to find some other source of exogenous variation that partly drives the variation one is really interested in. For example, perhaps the student union accidentally advertised the workshop in some dormitories and not others. This exogenous/accidental variation can serve as an instrumental variable for workshop participation. A large portion of all applied economics research in non-experimental data—including the entire agenda on regional trade shocks—relies on such instrumental variables. We developed a method that allows us to statistically estimate causal mechanisms in data where a shock (e.g. trade exposure) is not random but where we have an instrumental variable for it. Importantly, our method allows for trade to have unobserved effects (perhaps anxiety about globalization) that in turn influence both labor market outcomes and voting. As with any statistical framework, we do need to make some assumptions that will not always be appealing. Fortunately, in our research question—trade exposure’s effects on labor markets and voting—these statistical assumptions are very reasonable. So we applied this method—identifying the assumption on causal relations and estimating instrumental variables—and reached a surprising finding. We found that 170 percent of the total effect of trade exposure on populist voting is explained by labor markets. This is an important finding in the current policy debate. First, it implies that the negative labor market consequences of import competition from low-wage manufacturing countries have been even more consequential at the ballot booth than one might have thought. Second, it implies that trade integration can be a force for political moderation if we can cushion its negative labor market effects. Why would trade exposure’s other effects on voting be politically moderating? We are not sure yet. But a plausible hypothesis is that with increasingly fractionalized global supply chains, trading increasingly means working in international teams to bring all the different intermediate products and production steps together into final products. Christian Dippel is an Assistant Professor of Economics at UCLA Anderson School of Management. Dippel’s research interests include political economy, international trade, development economics, and economic history. Robert Gold is a researcher at the Kiel Institute for the World Economy. Previously, he worked at the Max Planck Institute of Economics in Jena, where he also received his PhD from the Friedrich-Schiller University. Stephan Heblich is Reader (Associate Professor) in Economics at the University of Bristol, UK. He is also affiliated with CESifo, IfW Kiel, IZA, and SERC. Rodrigo Pinto is an Assistant Professor of Economics at UCLA. His research develops empirical tools to infer the causal impacts of such government programs.